I remember my early days monkeying around in trees—the thrill of moving higher and higher and puzzling my next move one branch at a time, and feeling invisible from everything below. I recall the anxiety I felt the time I got stuck in my grandmother’s maple, and the countless hours spent in the tree house my dad built. I’d lay on my trampoline staring up at the sprawling branches of the 100-year-old oak next to my parents house, scheming the right bounce to project myself into its boughs and dreaming of the Swiss Family Robinson-style home I’d build in it one day. I’ve come a long way since those times. Yet, here I am, thirtysomething, and stuck in a 75-foot tulip poplar. Except for when the giant gently sways in the breeze and I cling to the trunk for security, I sit peacefully. The view from my perch along the Blue Ridge Parkway is breathtaking this time of year. Backed by a brilliant shade of cerulean blue, leaves of crimson, orange, and ochre sparkle in the sun. I didn’t arrive here by climbing from branch to branch, the first of which is 60 feet off the ground. No, I got here with ropes, knots, and a harness. Arborists have been climbing trees in this way for at least a century, and adventure seekers out west have been scaling the redwoods for several decades. But for the rest of the world, recreational tree climbing is a burgeoning sport. There are few people doing it, and even fewer teaching it. On the upside, it’s easy and rewarding. “Anyone who can walk up to the tree can climb it,” says Bob Wray. 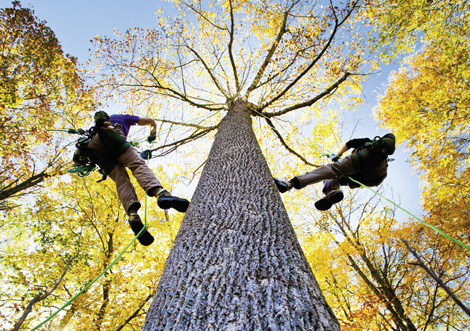 He operates Blue Ridge Tree Climbing from his 40-acre slice of heaven just over the state line in Meadows of Dan, Virginia, and is one of the few instructors in Southern Appalachia. On a spectacular October day, I had the pleasure of learning the ropes, so to speak. A handsome, bald man of medium height with a lifetime of adventures such as cave diving, white-water rafting, and rock climbing to his credit, Wray could be pegged as an ex-military thrill-seeker. Instead, the soft-spoken and observant Wray exudes calm, and it is a zest for life that has led him to adventure. Retired from a career as a commercial roofing consultant and living on his late parents’ property along the parkway, he spends his days hanging out in the forest canopy. Wray’s passion for the sport started more than 10 years ago when he saw a television segment about it. He poured over books on knots and sought out other climbers across the Southeast, including Peter Jenkins, known as the founder of the sport. Learning everything he could through courses near and far, Wray emerged as one of the few recreational climbers and instructors with no background as an arborist. Because of that, his method is unique: He uses less hardware and more knots, which he points out are free and impossible to lose. “Arborists throw high and climb fast. We throw low and climb slow,” he says. That’s a maxim you can tell he’s repeated many times to illustrate the difference between work and play. Wray has many sayings: my favorite, “If you’re sweating, you’re not doing it right.” So with the go-slow-and-enjoy-it motto in mind, I pulled on my harness and stepped up to the tree. Wray tossed a small weighted bag affixed with a long, nylon parachute cord over a thick branch 60 feet up. He tied the strong climbing rope to the end and hoisted it up and over the branch, then quickly and efficiently set about tying an array of knots with names like anchor hitch, double fisherman, and daisy chain. I’d have to take one of his three-day certification courses to remember what went where, but in the end, the system was surprisingly easy to use. As with any climbing venture, the harness is securely attached to the rope via a lanyard. Two prussic knots, one for the hand and another with a loop for the foot, slide up the rope, but won’t slip when weight is put on them. The maneuver is simply a step up, a repetition of sliding the knots upward and stepping into the loop. The other foot rests against the tree for balance. Now I’m not saying that it isn’t a little scary—my adrenaline increased the higher I climbed—but it is straightforward, and even meditative after a while. And when I reached the first branch and followed Wray’s instruction to rope myself securely to the tree, I was able to sit back in my harness, relax, and enjoy the view. Like kids, we spent hours climbing the branches and swapping stories; and I, too, found my Zen, as well as a bit of my youth. • Treeclimbercoalition.org is a forum linking climbers that’s operated by Cam Taylor of Kernersville. • Tree Climbing International (Treeclimbing.com) is run by Peter Jenkins, and offers tips and resources for networking. • Global Organization of Tree Climbers (gotreeclimbing.org) hosts an annual Rendezvous weekend of climbing. The next one is Nov. 11-13 in Jacksonville, Florida. • Sherrill Tree (WTSherrill.com) sells tree climbing gear. The cost to get into this sport starts at $700.